As part of Open Access Week 2018, the Office of Scholarly Communication is publishing a series of blog posts on open access and open research. 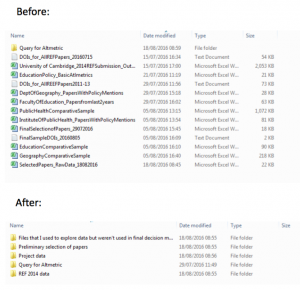 In this post Dr Mélodie Garnier provides some new insights into our Request a Copy service. 4,416. This is the number of requests for copies of material in our repository we’ve received over the past 12 months. Daunting, isn’t it? And definitely on the rise, with a 33% increase from the previous year. Two years and a half after its implementation in June 2016, our Request a Copy service is now more popular than ever. Our institutional repository Apollo hosts thousands of freely available research outputs, but also many that are under embargo. People from all over the world and from all walks of life are keen to access them. But what exactly do requesters want? And why do they want it? Our repository hosts a whole range of research outputs, but theses and journal articles are by far the most popular. Interestingly, the relative proportion of requested theses vs requested articles has shifted this year. From October 2016 to October 2017, requests for journal articles made up 56% of the total number of requests, and requests for theses made up 39%. Since last October, requests for journal articles have accounted for 38% of the total while theses have accounted for 59%. Looking at the raw figures, the number of requests for journal articles has actually gone up (from 1,647 to 1,689), though only slightly. But the number of thesis requests has more than doubled, going from 1,145 to 2,586. 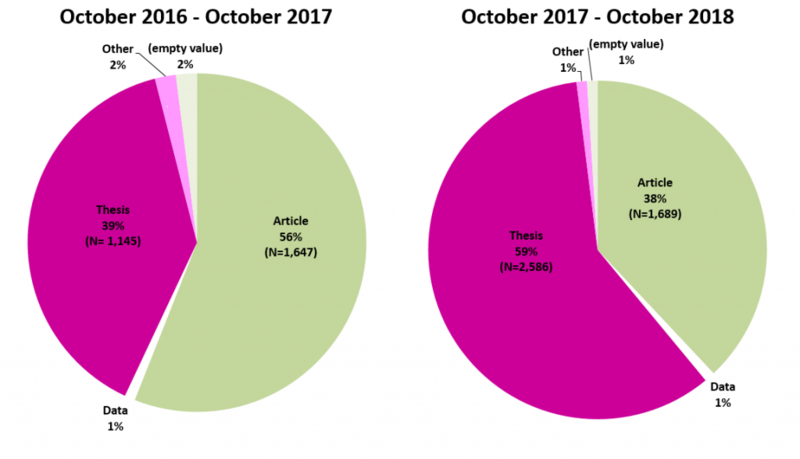 This is partly explained by the University of Cambridge’s requirement for PhD students to upload their theses from 1st October 2017, leading to 1,279 new theses uploads. On top of these, we have added around 1,300 historical British Library theses and around 200 scanned historical theses from the Digital Content Unit. So between 2,500 and 3,000 theses have been added to Apollo this year alone (more on this tomorrow for #ThesisThursday). Aside from the gold medal winner, all the other works were published this year and have only been available in Apollo for a few months. So it is striking to see how popular some of them have become in quite a short period of time. A case in point is the zoology article, which was deposited in Apollo only last month and first published shortly afterwards. Another interesting example (not included in the top 5) is a PhD thesis deposited in Apollo at the end of August. From 18 in September, the Apollo record has gone up to an astounding number of 911 visits in October (and counting), with a surge of requests. What happened in between? The author publicised her thesis on a Facebook society page, pointing to the repository record link for access. We only became aware of this as requesters explicitly referred to that page, but it’s possible that similar things happen a lot of the time. So aside from traditional media outlets, the influence of social media on number of requests received can be quite dramatic, and probably greater than we could ever capture. When requesting a copy of an embargoed article or thesis, people are prompted to leave a message alongside contact details. This is so they can introduce themselves and explain why they are interested in accessing the work, mainly so that authors can make informed decisions on whether to accept or reject requests. Quite often these messages have little to no useful information, but some can be informative in a number of ways. Through them we can get a glimpse of the range of people accessing the repository – their geographical provenance, background and professional occupation. We can also get a sense of the range of interests that people have (which may appear very specialised, if not a little obscure). And crucially they tell us what people want to do with the research – whether use it as reference, apply it in their professional sphere or simply read it for pleasure. Why do people request work? Broadly speaking, people request work in Apollo for the following purposes: reference/citation, personal interest/leisure, replication of results for research purposes, and need to inform professional practice. But those broad categories can include several sub-categories, for example personal interest can stem from hearing about the research in the media or knowing the author. Getting the full detailed account of why people request work from our repository would require going through messages individually, and perhaps some degree of subjective judgement. Since launching the Request a Copy service we’ve had over 8,000 requests – so even if uninformative messages were excluded, the analysis could be fairly time-consuming. But certainly worth exploring, so watch this space. Although there is a definite cost to running Request a Copy in terms of staff time, it is clear how popular and valuable a service it has become. As its popularity increases so does the need for process efficiency, however. This is currently a big priority for us and something we’ll have to keep working on, but we think the benefits for researchers and the wider community are worth it. As part of Open Access Week 2016, the Office of Scholarly Communication is publishing a series of blog posts on open access and open research. In this post Dr Lauren Cadwallader discusses her experience of researching openly. However, it’s been several years since I last carried out an academic research project and my previous work was carried out with no idea of the concept of open research (although I’m now sharing lots of it here!). Throughout my project I kept a diary documenting my reflections on being open (and researching in general) – mainly the mistakes I made along the way and the lessons I learnt. This blog summarises those lessons. I carried out a PhD at Cambridge not really aware of scholarly best practice. The Office of Scholarly Communication didn’t exist. There wasn’t anyone to tell me that I should share my data. My funder didn’t have any open research related policies. So I didn’t share because I didn’t know I could, or should, or why I would want to. I recently attended The Data Dialogue conference and was inspired to hear many of the talks about open data but also realised that although I know some of the pitfalls researchers fall into I don’t quite feel equipped to carry out a project and have perfectly open and transparent methods and data at the end. Of course, if I’d been smart enough to attend an RDM workshop before starting my project I wouldn’t feel like this! My PhD supervisor and the fieldwork I carried out had instilled in me some practices that are useful to carrying out open research:. This is something I learnt from my PhD and found easy to apply here. Altmetric.com sent me the data I requested for my project and I immediately saved it as the raw file and saved another version as my working file. That made it easy when I came to share my files in the repository as I could include the raw and edited data. Big tick for being open. Another thing I was told to do during my PhD lab work was to record everything you do. And that is all well and good in the lab or the field but what about when you are playing with your data? I found I started cleaning up the spreadsheet Altmetric.com sent and I went from having 36 columns to just 12 but I hadn’t documented my reasons for excluding large swathes of data. So I took a step back and filled out my project notebook explaining my rationale. Documenting every decision at the time felt a little bit like overkill but if I need to articulate my decisions for excluding data from my analysis in the future (e.g. during peer review) then it would be helpful to know what I based my reasoning on. I was working on this project just one day a week over the summer so every week I was having to refresh my mind as to where I stopped the week before and what my plans were that week. I was, of course, now making copious notes about my plans and dating decisions so this was relatively easy. However, upon returning from a week’s holiday, I opened my data files folder and was greeted by 10 different spreadsheets and a few other files. It took me a few moments to work out which files I needed to work on, which made me realise I needed to do some housekeeping. Aside from making life easier now, it will make the final write up and sharing easier if I can find things and find the correct version. So I went from messy computer to tidy computer and could get back to concentrating on my analysis rather than worrying if I was looking at the right spreadsheet. One morning I had been working on my data adding in information from other sources and everything was going swimmingly when I realised that I hadn’t included all of my columns in my filters and now my data was all messed up. To avoid weeping in my office I went for a cup of tea and a biscuit. Upon returning to my desk I crossed my fingers and managed to recover an earlier version of my spreadsheet using a handy tip I’d found online. Phew! I then repeated my morning’s work. Sigh. But at least my data was once again correct. Instead of relying on handy tips discovered by frantic Googling, just use version control. Archive your files periodically and start working on a new version. Tea and biscuits cannot solve everything. After a couple more weeks of problem free analysis it was time to present my work as a poster at the 3:AM Altmetrics conference. I’ve made posters before so that was easy. It then dawned on me at about 3pm the day I needed to finish the poster that perhaps I should share a link to my data. Cue a brief episode of swearing before realising I sit 15ft away from our Research Data Advisor and she would help me out! After filling out the data upload form for our institutional repository to get a placeholder record and therefore DOI for my data, I set to work making my spreadsheet presentable. I only have a small data set but it took me a lot longer than I thought it would to make it sharable. Part of me was tempted just to share the very basic data I was using (the raw file from Altmetric.com plus some extra information I had added) but that is not being open to reproducibility. People need to be able to see my workings so I persevered. I’d labelled the individual sheets and the columns within those sheets in a way that was intelligible to me but not necessarily to other people so they all needed renaming. Then I had to tidy up all the little notes I’d made in cells and put those into a Read Me file to explain some things. And then I had to actually write the Read Me file and work out the best format for it (a neutral text file or pdf is best). I thought I was finished but as our Research Data Advisor pointed out, my spreadsheets were returning a lot of errors because of the formula I was using (it was taking issue with me asking it to divide something by 0) and that I should share one file that included the formulae and one with just the numbers. If I’d had time, I would have gone for a cup of tea and a biscuit to avoid weeping in the office but I didn’t have time for tea or weeping. Actually producing a spreadsheet without formulae turned out to be simple once I’d Googled how to do it and then my data files were complete. All I then needed to do was send them to the Data team and upload a pdf of my poster to the repository. Job done! Time to head to the airport for the conference! Lesson #7. Making your work open is very satisfying. Just over three weeks have passed since the conference and I’m amazed that already my poster has been viewed on the repository 84 times and my data has been viewed 153 times! Wowzers! That truly is very satisfying and makes me feel that all the effort and emergency cups of tea were worth it. As this was a proof-of-concept study I would be very happy for someone to use my work, although I am planning to keep working on it. Seeing the usage stats of my work and knowing that I have made it open to the best of my ability is really encouraging for the future of this type of research. And of course, when I write these results up with publication in mind it will be as an open access publication. But first, it’s time for a nice relaxed cup of tea.